scrap material processing | North American Dismantling Corp. This project consisted of the demolition of all structures on site with only the concrete foundations to be left in place. North American Dismantling Corp. (NADC) subcontracted a local asbestos abatement firm to perform all asbestos abatement on this project. The asbestos abatement included, but was not limited to, asbestos siding removal and transite sheeting from offices and storage areas. All accumulated waste on the site was disposed at the approved vendor landfill. 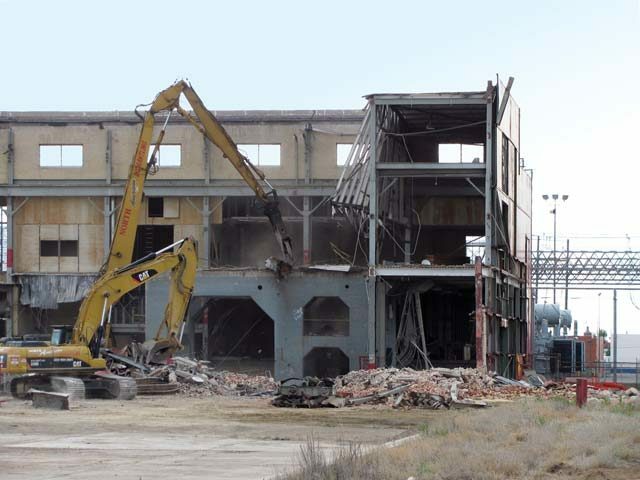 Following the asbestos abatement, NADC performed demolition on numerous buildings at the site including the maintenance shop, main plant, pole storage barn, metal storage building, brick storage building, utility storage shed, wooden fire houses, can crushing building and any equipment residing in any of the buildings listed. The buildings removed totaled approximately 200,000 sq. ft.
All scrap materials from the site were the property of NADC at the commencement of the project. It was NADC’s responsibility to take title of all equipment and structures onsite and consider all options for the removal of equipment to include scrap processing, resale, etc. NADC followed all required state and federal regulations for the removal of the facility to include waste disposal regulations for items recycled.